Dr. David Plaster (pictured), vice president for academic affairs at Grace College, Winona Lake, Indiana, has received the McClain Award for Excellence in Teaching. The award was given in college chapel this morning. Named in honor of Grace’s founding president, Dr. Alva J. McClain, the award is presented every two years to a faculty member who is an outstanding example of teaching excellence. 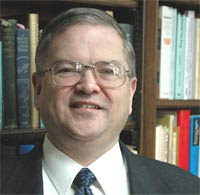 Dr. Plaster has served as a teacher and administrator at Grace since 1984. He has taught courses in the college and seminary, in the prison extension program, and in the distance education program. He is a graduate of Grace College (BA), Grace Theological Seminary (MDiv, ThM), and Dallas Theological Seminary (ThD). In addition to his work at Grace, he has served in the pastorate, written two books, and taught overseas. One of his books, Finding Our Focus, is the history of the Fellowship of Grace Brethren Churches, published by BMH Books. He recently accepted the position of senior pastor of the Grace Brethren Church of Columbus, Ohio. He and his wife, Ginny (Crees, BS 71), will move to Columbus at the end of this school year. He is featured in an article in the current GRACE alumni magazine.